The Charlotte Chamber held its annual Economic Outlook Conference yesterday at Charlotte Convention Center. You can read The Charlotte Observer article, "CEOs see slow economic growth in 2012," to learn what executives from five of the country's largest businesses and the Federal Reserve had to say about the economy. I just wanted to share one of the Observer's photos here because it shows how much money was in the room yesterday, which you can see from the six esteemed gentlemen on the stage (each of the corporations they represent are either headquartered in Charlotte or have a large presence here). There were also numerous CEOs, presidents, and other top executives in attendance. 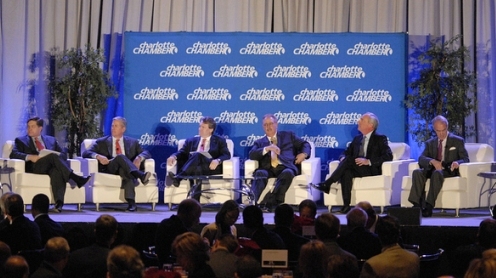 Pictured from left to right: Jeffrey Lacker, president of the Federal Reserve Bank of Richmond; David Carroll, senior executive vice president of Wealth, Brokerage and Retirement Services for Wells Fargo; Brian T. Moynihan, president and CEO of Bank of America; Dan DiMicco, chairman and CEO of Nucor; Christopher Kearney, chairman and CEO of SPX; and Jim Rogers, chairman and CEO of Duke Energy. Photo by Jeff Willhelm/The Charlotte Observer. Click here to see full gallery.